The initial family of AMD's FX-series microprocessors based on Bulldozer micro-architecture will include four models with eight, six or four cores and 95W or 125W thermal design power (TDP). The first breed of AMD FX8000, FX6000 and FX4000 currently known under Zambezi code-name will completely support all the advantages that the Bulldozer micro-architecture is supposed to bring, including new Flex FP floating point processing unit. The new chips in maximum eight-core configurations are projected - by AMD's internal documents - to offer roughly 50% performance improvement over Phenom II-series microprocessors in multimedia applications. The primary family of AMD FX-series central processing units (CPUs) will feature two eight-core models, one six-core flavour as well as a quad-core version. The chips will support dual-channel DDR3 1866MHz memory, will support Turbo Core dynamic acceleration technology and will come in AM3+ form-factor and will have 125W and 95W TDP. The second "wave" of Bulldozer chips will also include four microprocessors and will improve performance of the initial breed of CPUs. The intrigue remains about exact clock-speed of Bulldozer chips. Based on estimations, frequencies of such chips may be as high as 3.50GHz. What should be noted is that modern CPUs can include units that work at different clock-speeds and the highest one will hardly determine actual performance. Four chips are not a large number and they will hardly be able to properly compete against rather huge Intel Core i7-series microprocessors, which includes quad-core and six-core offerings. But this - initial offering by AMD - may not be the "army" to attack Intel, but rather than a lineup to show what AMD is capable of: creation of a competitive high-end microprocessor. The second breed of Bulldozer-based chips due in Q4 is supposed to really improve AMD's positions on the market of expensive central processing units. By the end of the year AMD, based on a document seen by X-bit labs, expects approximately 10% of its CPUs to be FX-series in AM3+ form-factor. 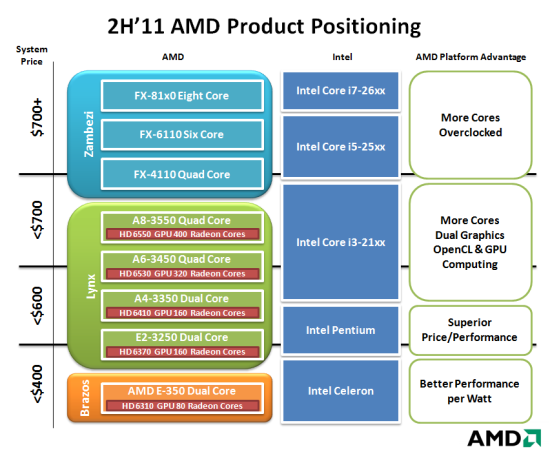 AMD Orochi design is the company's next-generation processor for high-end desktop (Zambezi) and server (Valencia) markets. The chip will feature eight processing engines, but since it is based on Bulldozer micro-architecture, those cores will be packed into four modules. Every module which will have two independent integer cores (that will share fetch, decode and L2 functionality) with dedicated schedulers, one "Flex FP" floating point unit with two 128-bit FMAC pipes with one FP scheduler. The chip will have shared L3 cache, new dual-channel DDR3 memory controller and will use HyperTransport 3.1 bus. 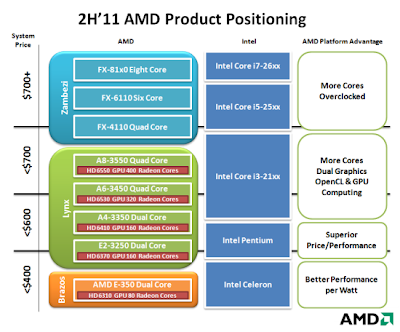 The Zambezi chips will use new AM3+ form-factor and will require brand new platforms. The Sunnyvale, California-based chip designer plans to introduce AMD 900-series chipsets compatible with Zambezi processors in Q2 2011. The Bulldozer processors, Radeon HD 6000 "Northern Islands" discrete graphics cards and AMD 900-series core-logic sets will power AMD's next-generation enthusiast-class platform code-named Scorpius. byk ilmu yg saya dapat dari blog ini. tahniah. teruskan menulis dan membentangkan pelbagai ilmu yg boleh dikongsi. sebab panas.peduli la apa orang kata. janji senang kerja buat grafik.